Glyndebourne Festival Opera's production of Billy Budd, Benjamin Britten's seafaring masterpiece based on the Herman Melville novella, opens tonight in the opera house. 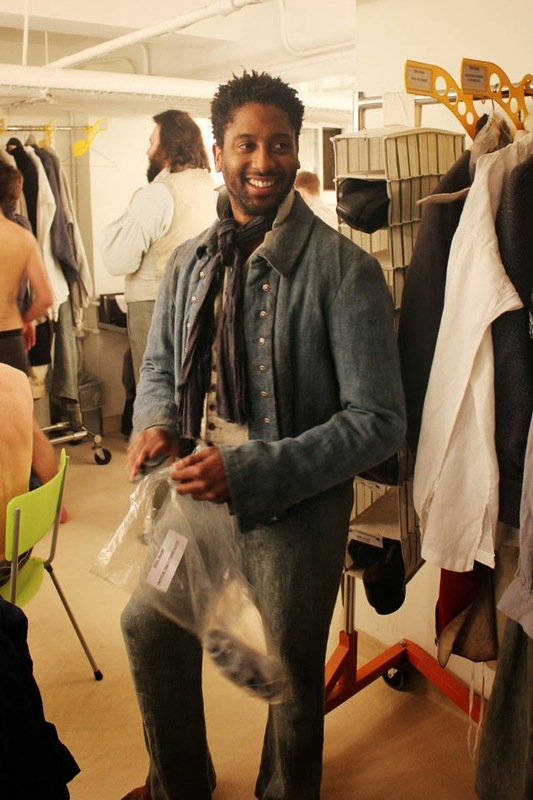 The all-male company—all 148 of them!—have been in town for over a week now, and Glyndebourne Chorus member and baritone Peter Brathwaite was kind enough to take a break from rehearsals and sightseeing to answer the BAM Blog Questionnaire. 1. Which artist do you admire from a field other than your own? I am a big fan of Mark Rothko. Over the years the Rothko Room at London's Tate Modern has become a bit of a sanctuary for me. There is something incredibly powerful about the way Rothko uses tone, texture and scale and I can't help but find great solace in his paintings. 2. Any advice you've gotten and ignored? I think as a musician you learn to be open to all advice because it often paves the way to finding out what really works for you individually. 3. What ritual or superstition do you have on performance days? I like to exercise before a performance, so I might go for a run, swim or do some yoga. Food forms the basis of my pre-show ritual a I like to make sure I've eaten well before a performance. I usually choose to eat something clean and simple like grilled fish with vegetables. 4. What did you pack in your suitcase for your trip to Brooklyn? Given the recent cold spell, my suitcase was filled in the main with thermals and winter woollies. When we arrived last week it was -9c so I was grateful to be kitted out appropriately. My mother is relieved I have my longjohns with me! 5. What are you looking forward to doing while in New York? Some of us have tickets to a Brooklyn Nets game which should be great fun. The MoMa, Whitney and Guggenheim all have Rothko pieces in their collections so I'm looking forward to visiting those galleries. I don't have a fixed an agenda for down time but instead plan to soak up the sights and sounds of the City by foot and I can't wait to check out the 10 Best Chicken Wing Spots in New York City. 6. The dressing rooms at BAM aren’t the biggest. What’s it like to share the space with 147 other company members? Any fun stories? The ensemble nature of Billy Budd means that we have developed a great camaraderie so sharing dressing rooms isn't really an issue. The Green Room at BAM is well stocked with tea and coffee and provides a cozy retreat. The huge sofas were especially welcome the day after Super Bowl when many of us were suffering from the "meat sweats." 7. What is your favorite part of the Billy Budd score? My favourite part of Billy Budd has to be the "Below Decks" Scene in Act 1. The "Blow her away" section is absolutely thrilling to sing because of the long sweeping phrases and the robust orchestration which really evokes the sea. You can read more about Peter's adventures in New York on the Glyndebourne blog. Follow him on Twitter at @PeterBrathwaite, and visit his website, PeterBrathwaite.com.